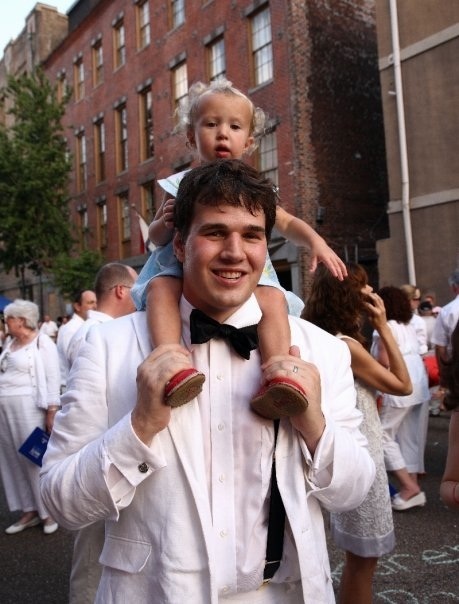 My husband and daughter on White Linen Night 2008. I knew Jamie was slowly embracing New Orleans when he bought a white linen suit. In a nod to his St. Louis roots|! !| though|! !| the cuff links are a mug of beer and a pretzel. The first time my now-husband took me home to meet his parents, I was a little nervous. That is, I was a little nervous until we pulled off of the interstate and into total suburbia. Then I became uneasy. When we pulled on to a secluded private street, I became afraid. And when we parked and walked into an immaculate two-story brick home with a well-kept lawn, I became petrified. Once we were inside, my husband, the sweetest Midwestern boy anyone has ever known, gave the air an exaggerated sniff and said, “Mmm, Mom made apple pie!” I almost turned and fled. What I thought is not printable, but the gist of it was that I was way out of my comfort zone and in way over my head. These were not my people. I grew up sneaking into Tipitina’s with my mom to see my godfather, Gary Hirstius, perform with Theresa Andersson, amazing shows that kept me out way past a traditional childhood bedtime. I grew up running through the halls of the Contemporary Arts Center where my mom worked, watching age-inappropriate performance art and doing my math homework in the middle of bizarre modern art displays. I grew up in the top half of a run-down mauve duplex on the outskirts of Lakeview, my parents split up when I was 9, and my mom is a fabulous cook but was never much of a pie-baker. So walking into such a slice of Americana, into a Norman Rockwell painting, into a “Pleasant Valley Sunday,” scared the everlasting crap out of me. His parents couldn’t have been nicer, of course, nor could his brother and sister and dog, but that didn’t put me at ease. Their staggering and profound normalcy actually freaked me out. We went out to dinner at a malt shop in downtown St. Louis and attempted to make polite conversation, but I was so scared of saying the absolute wrong thing that I nibbled a handful of potato chips and sipped a chocolate soda and didn’t say much of anything at all. I couldn’t have made a great impression. But at the end of our freshman year of college, the wholesome high school football player with the rosy cheeks and the apple pie-baking mother and I were still very much together and very much in love. “Come visit New Orleans with me,” I begged him, and so we packed up his ’77 Plymouth Valiant and headed down Interstate 55. I was certain that Jamie would be crazy about the city. The food, the people, the wild green foliage, the architecture: What’s not to love, right? But we stayed very much together and very much in love, and over the next decade, he and I made many, many, many more trips down Interstate 55 together. Every time, he’d get the city a little bit more, be a little more charmed by its quirks. Even when we moved here, though, I was pretty sure he’d always be a St. Louis boy who just happened to live in New Orleans, much as I had been a New Orleans girl who just happened to live in the Midwest. I was shocked and delighted, therefore, when he bought a full white linen suit and accouterments on the advice of our very own Errol Laborde, the ultimate Southern gentleman. I was even more pleasantly surprised when he not only wore the suit to a recent wedding we attended in Missouri but also tried to instruct the bartender on the proper way to make a Sazerac. It makes my heart happy to watch his evolution into a New Orleanian, though of course he’s still mostly the all-American guy I fell in love with. And as in all healthy relationships, he’s not the only one who has changed and grown and expanded his horizons. Because I now have his mother’s apple pie recipe –– and will be baking it more and more as the weather cools down.